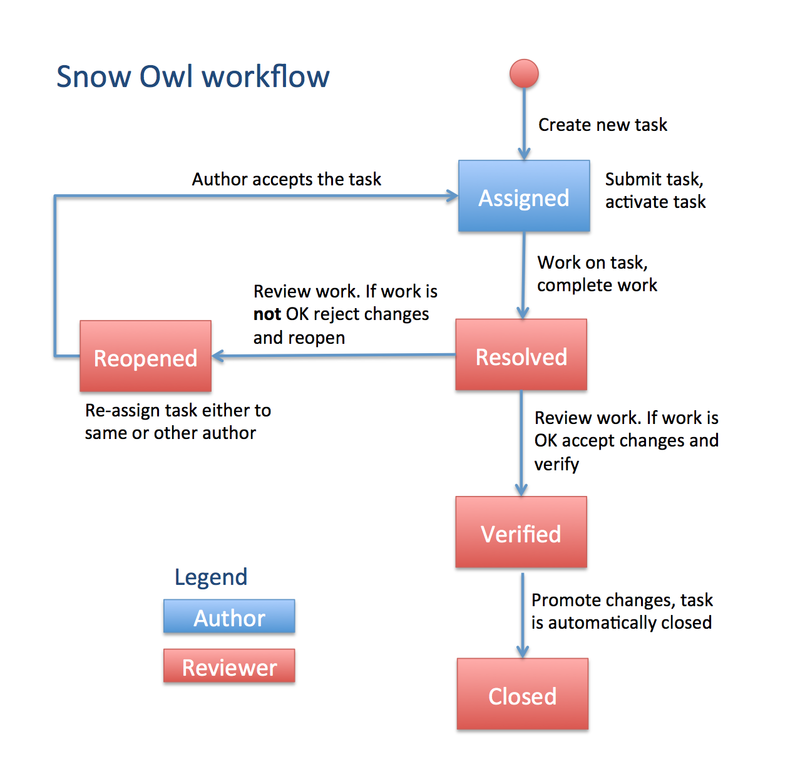 Snow Owl has been architected to author terminologies in a distributed and collaborative fashion. Users can work in the same location or can be geographically distributed, as long as they have network access to a central Snow Owl terminology repository. In order to coordinate the efforts of multiple authors concurrently editing the same ontology, separate tasks can be assigned to them. Tasks have a lifecycle that spans from their initial creation through an authoring and reviewing stage to their final approval. Changes made as part of a task are not visible to other authors until they have been approved. All authors working on the same task see the changes made by any other authors working on that task. The task lifecycle is configurable and can be adapted to meet specific workflow requirements. Before you can start working in a collaborative mode, you need to be connected to a shared repository. A detailed description for the necessary steps can be found in the section about Setting up a remote task repository. Here is a short summary of the different stages in a typical task lifecycle. The links will help you to find the corresponding sections in the user guide. New task is submitted to the shared repository, team members are automatically assigned to the task. Task is activated. This means the team member started working on the task. Work is performed. While you are working on the task, it's useful to follow up on changes performed by your team members. Task is resolved as fixed and handed over on to the reviewer. Task is reviewed. Changes have to be accepted or rejected. Reviewer either marks the task as verified, or reopens the task. If the task is reopened, the assigned author has to accept the task. Task is promoted and can be seen by everyone. The promotion automatically closes the task. The different steps of the task lifecyle are associated with certain task stages and actions that can be performed. The user interface of the task editor will change respectively. The table below gives an overview. Depending on the work scenarios, the task wizard creates different task configurations.